When I wasn’t looking, September changed to Fall and the calendar pages became October. Seasons changing triggers many things for us all. Harvest season, more family time as activities are again focused on being indoors, and looking forward to the Trilogy of holidays: Halloween, Thanksgiving, and Christmas. I look forward to the season’s change for having more time to devote to play … uh oh, work ! Time to get in my darkroom / computer and make some fresh artwork. 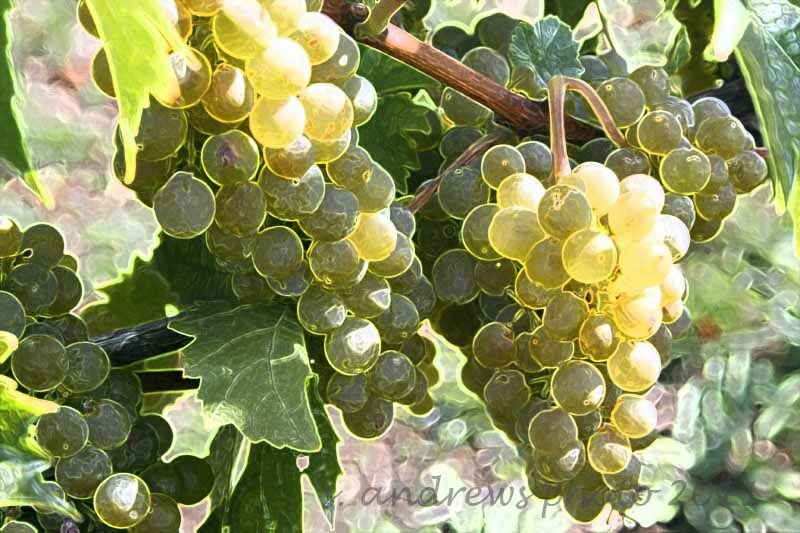 This morning I received an email with a request for some of my grape / grapevine images. I had something new I had been tinkering with, so I finished that and sent off the email. I seem to have a lot of irons in the fire right now, winding down my summer project of photographing the Master Gardeners Open Gardens, gearing up for my next show, the Country Christmas in November, and trying a few new things to get my photos “out there”. 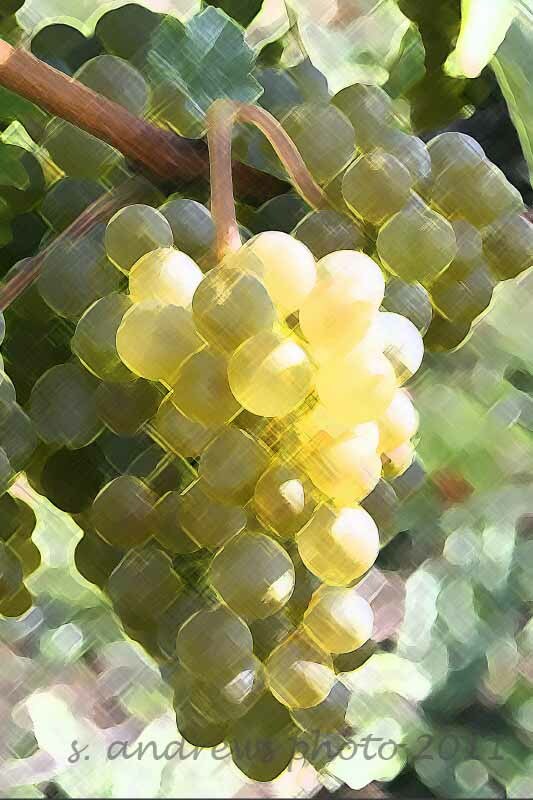 This cluster was eye catching before I began to edit it, because of the different shades of the grapes as they were ripening. 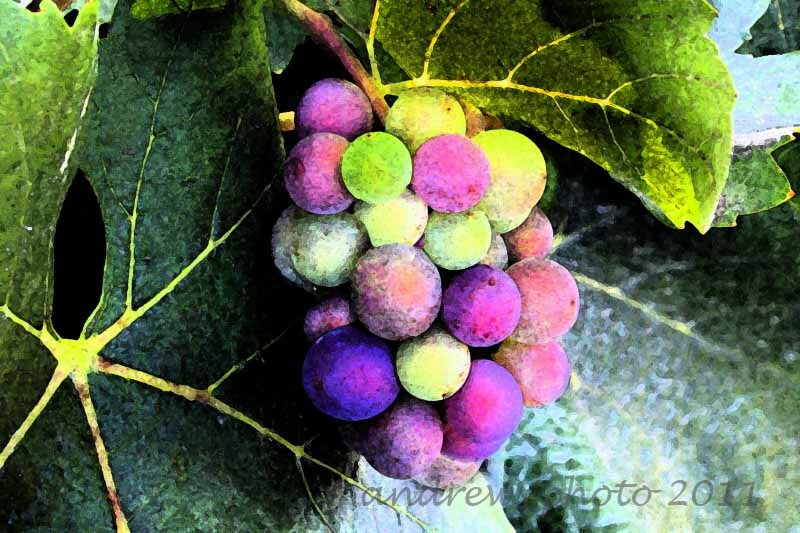 The photos were taken at a winery here in the Willamette Valley. Stepping back, I like the contrast in texture from the leaves to the fruit. 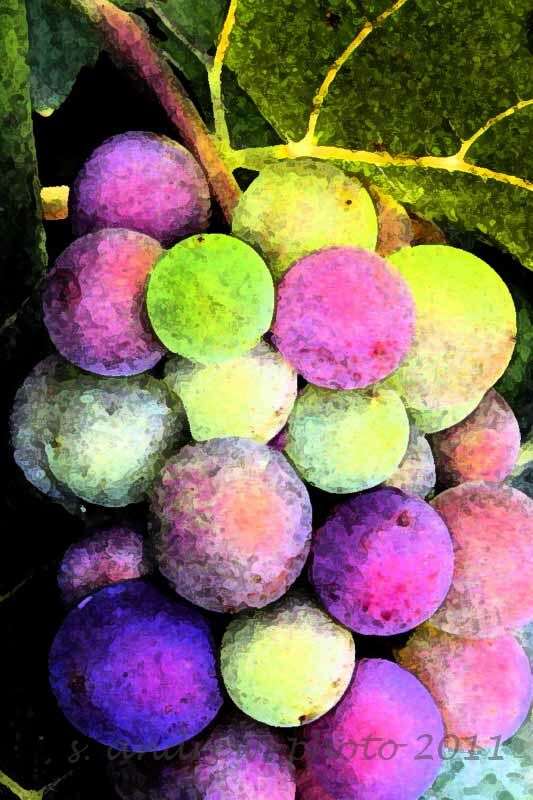 I am thinking the Grapes White and Purple would make a nice canvas print. This one has been a part of my portfolio from the beginning. OK, I looked up to see a leaf falling from maple tree and saw it. Yes like you said it crept into my back yard. Not even a hello or a wind gust saying “I’m back”.Wow time is to fast and I think I’m missing something. Thank you for your pictures that take me to some of the stuff I didn’t stop to see.